Two cats found dead in Fareham had injuries “consistent” with others thought to have been killed by the so-called Croydon cat killer. The decapitated body of a black and white crossbreed was found in her owner’s garden in Down End Road. Her tail had also been removed. The mutilated body of a tabby cat was found in a garden in The Thicket. 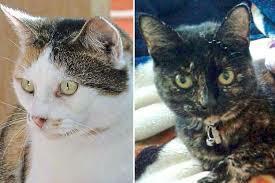 South Norwood Animal Rescue and Liberty (Snarl) said it believed the two cats were killed at the same time. The charity said the owner of the tabby cat had not yet been found. The Metropolitan Police has been investigating a series of “gruesome” killings that began in Croydon in 2015. Representatives from the charity Snarl visited Whiteley Village Vet Centre in Fareham to analyse the injuries of the dead pets, which it said matched with other deaths by the infamous serial feline killer. The rescue charity believes more than 400 animals have been killed in the same manner since then – mainly cats, but also rabbits and some foxes. Snarl is helping police and a specialist forensics laboratory to piece together the times and locations of a number of deaths thought to be the work of the same person, once dubbed the Croydon Cat Killer.